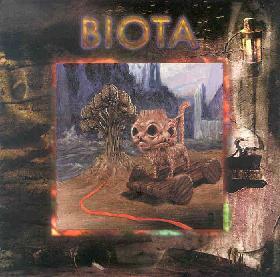 Biota began life in 1979 as the Mnemonist Orchestra and later split into musical and visual parts of the group, with Biota being the musical and Mnemonist being the visual. The CD booklet, which includes some stunning artwork, lists both musician credits for Biota and art credits for Mnemonists (there is crossover among the two groups). Being on the RéR label is always a good sign that someone's music will be interesting and off the beaten path, and having never heard Biota's music (this is their sixth release) I was particularly intrigued after reading the lineup of instrumentation: violin, slide guitar, rubab, reeds, clavioline, balalaika, accordion, pump organ, hurdy-gurdy, drums, percussion, Rhodes, nae, trumpet, piano, Biomellodrone keyboard, acoustic and lap steel guitars, electric guitars, and electronics. The nature of the electronics isn't specified but suffice it to say the music on Invisible Map is a royal banquet of creative acoustic compositions, collages, and fun. The set opens with a trippy Middle Eastern theme, but quickly moves into a quirky but intriguing song with multiple layers of acoustic stringed instruments, a screaming call-to-prayer horn, and beautiful vocals from Genevieve Heistek. I read in Biota's bio that Susanne Lewis (Hail, Thinking Plague) has been involved with the band in the past and Heistek's style reminds me of Lewis. And from here the music embarks on an evolution through 37 tracks that cover a myriad of styles performed in the avant-progressive rock spirit. The ethnic folk influences are strong... the accordion, balalaika, and varied percussion often making us feel like we're at Greek weddings, Egyptian markets, and perhaps even on the American frontier. Traditional musical styles, ambient drones, chamber music, and sporadic hints of jazz are all the order of the day. Enchanting melodic bits quickly become dark dissonant theatrical sections... and then a song. The music segues seamlessly through its many themes making the 37 tracks really play as one continuous piece. Being a huge fan of avant-progressive rock I'm surprised I hadn't heard Biota until now, and Invisible Map is quite a find. I'll have to explore their back catalog. And the Eastern influences, ethnic horns, and powerful ambience create a trippy psychedelic element in their music, making this an excellent way for Aural Innovations readers to get their feet wet in progressive rock's more adventurous realms. Recommended. For more information you can visit the Biota web site at: http://biotamusic.com. Invisible Map is released by the RéR label. You can visit their web site at: http://www.rermegacorp.com/index.htm. Distributed in the USA by Cuneiform. You can visit their web site at: http://www.cuneiformrecords.com.